I don't know Australian plein air artist Warwick Fuller personally but I can't deny his early influence on my still-evolving style. 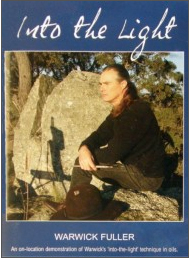 Fuller's DVD "Into the Light" represented a turning point in my art career. This video was the first time I'd actually seen someone start a painting with large tonal masses then lay light and detail over the top – and he completed the not-too-small painting en plein air. Suddenly it all made sense. 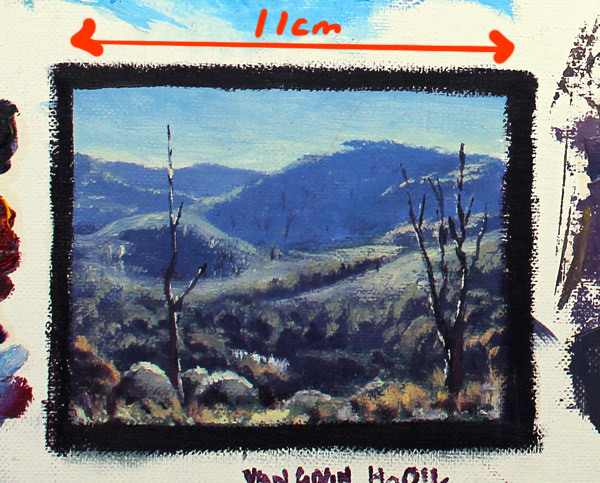 My first-ever oil painting was a miniature copy of Fuller's landscape painting, a small image of which appeared on the cover of the VHS edition. I still have my version of the painting (below) on a large canvas board with lots of other small painting exercises I did when I took up oils. My first oil painting. 11x8cm. I used three water-mixable oil colours, plus white. Many of my early works were largely attempts at using Fuller's approach and capturing his style with local subjects. Fuller's work has featured regularly in Australian Artist Magazine, for as long as I can remember, so I had no shortage of other examples to learn from. And now, Warwick Fuller has met with royalty. Warwick Fuller, a Hartley-based artist, has had an impressive career. With over sixty solo exhibitions in Australia and internationally, career highlights have assuredly been numerous. Yet his recent week painting as Official Tour Artist for His Royal Highness The Prince of Wales and Her Royal Highness The Duchess of Cornwall, during their tour of Australia, would doubtless rank foremost among them. The Prince of Wales became familiar with Fuller’s work through his London gallery, Panter and Hall, who were contacted by Clarence House back in July. Fuller says, "I was completely overwhelmed when I learnt of the surprising request from The Prince of Wales". A watercolourist himself, the Prince has a policy of choosing an artist to accompany him on tours, appreciating the unique interpretation that an artist can give to the documentation of the tour, and as a way of supporting the arts. Paintings from the tour that are acquired by the Prince of Wales will become part of the Royal Collection when he ascends the throne. The tour gave Fuller a unique opportunity to experience places and events usually inaccessible: rarely seen paintings by Roberts, Streeton and Ashton at the Sydney and Melbourne government houses, reminiscing with Prince Charles over memories of trout fishing in the Howqua River and camping and painting in Victoria, and enviable access to the private member’s stand at Melbourne Cup. He fondly recalls painting beside the Flemington racetrack-mounting yard, in a "halo of space and quiet” in the otherwise clamorous throng of people as the Melbourne Cup race commenced. It was by no means surprising that the Prince should choose Fuller as his Australian tour artist. Fuller’s artworks timelessly and majestically capture the atmosphere of the Australian landscape. His paintings are not a record of its existence, they are a hymn to it, and as such he is able to make evident to all the beauty and nuances that many overlook; and yet his paintings go further; he imbues nature with something more: to borrow from Edward Bulwer-Lytton, “the mind and soul of man”. During the tour, Fuller was filmed painting at Penfolds Winery and interviewed with the intention of his inclusion in a documentary being made on artists of the Royal family. The documentary will air on British television next year. In summing up his experience, Fuller enthuses, "This amazing honour has been a career highlight, one I’ll savour when chasing the elusive light of the Australian landscape”.